I’ve been writing on this blog on and off for the past 2.5 years and I’ve never had a blog that is as hard as this one to write. It’s not that the words won’t come out, or that it is physically hard for me to write this blog, but this blog is tough for a completely different reasons. So why is this blog hard to write? It’s one of the more vulnerable posts that I’ve written, but that’s still not even the issue. I’m asking for help, that’s why. Normally I have a hard time asking for help from people unless it is something that I literally cannot do alone. Asking for a ride to the airport is no problem for me, but asking for someone to come help me move a large piece of furniture might make me try it myself first. Then once I get started trying on my own, don’t even bother asking me to help…I can be a bit stubborn. Today though, I must come to you all for help. I must lower my normal defenses to present my struggle and ask for you to stand up next to me and partner with me. As you may or may not be aware, I will be making a trip back to the US this August and September in order to find more ministry partners and meet with existing ones as well. I thought I would be fine until then…but I’m not. As you can tell, each month that goes by I am short by around $1000 and this quickly drains any reserves that were built up over the last two years or so. This blog isn’t to guilt people into supporting me but it is to help explain the need and to ask for help. The good thing is, help can come in a variety of ways that I will lay out for you below. I know God will take care of my needs, but it is not without effort on my part. I appreciate all of you who have read this far whether you feel led to help in one way or another. 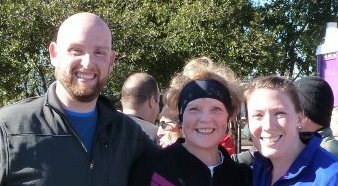 My mom, step-sister Kim and I after the Charleston half-marathon. As some of you might now, my mom and I are training to run our second half-marathon in 4.5 months. We ran her first and my second-ever half-marathon this past January in Charleston and we signed up to do the Glass City Half-marathon in Toledo at the end of April. Our training involves three morning (as early as 5:30, gross!) runs every week. This means that in addition to seeing each other other times throughout the week we are almost guaranteed to hang out with each other for at least 3 hours a week, just the two of us. Now, I’m not saying that all of the time is “quality” time since we can’t always carry on a conversation while running, but to me all of it is quality. While we were running today I was thinking about how blessed by God I have been to be able to do this with my mom. You see, as of five years ago, I wouldn’t have been able to run 1.31 miles let alone 13.1. As of last year, my mom hadn’t run more than 5 miles in her life and some weeks that is our shortest distance. Had God not allowed me to lose weight or had He not put the idea of running a half-marathon into my mom’s head we wouldn’t be doing this. We would not see each other multiple times a week and be able to truly enjoy interim time before I go to Germany for at least four years. I am so thankful that God has given me this time with my mom and I will never forget this time. Beyond the fact that I never imagined my mom and I running together I cherish this time, because I get to train her. My whole life my mom has been my biggest supporter. She has cheered me on in sports when I was incredibly mediocre, come to my side when I was in the hospital, taught me how to treat every person with love and supported me even when I was destroying myself with food. Now I get to be her strength, I get to cheer her on, I get the opportunity to run by her side reminding her achieve her goal. I would not trade that for anything. Thank you God for giving me an amazing mom and for allowing me this opportunity to be her support. Author Jacob CoonPosted on March 26, 2012 March 26, 2012 Categories randomTags Charleston, Charleston marathon, encouragement, Glass City Marathon, half-marathon, mom, running, support, Toledo, trainingLeave a comment on Mom, this is for you!